Firestone Drag slicks are manufactured in the USA in new molds designed from the original Firestone drawings. 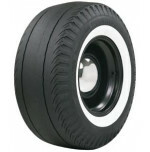 Available in either black wall or white wall, these slicks feature tubeless construction and a tread compound specifically designed for nostalgic hot rods. Best of all, they feature just enough tread and sidewall grooving to make them DOT approved and street legal. 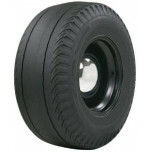 They are perfect for matching with smaller Firestone bias-ply tires for that period correct Big-n-Little look. Don't pay more and settle for less.